Upcoming at the Andipa Gallery is a new solo exhibition titled 'Concrete Ocean' featuring the works of Slinkachu. Left floating in flimsy boats on puddles the size of lakes, or clinging onto seemingly giant paving stones, in danger of being trodden underfoot by the casual passer-by, the figures in Concrete Ocean address the artist's trademark theme of loneliness and disillusionment engendered by the city environment. The dry wit of his observation and the deceptive sweetness of his scaled down figures make Slinkachu's works absorbing, strong and engaging. 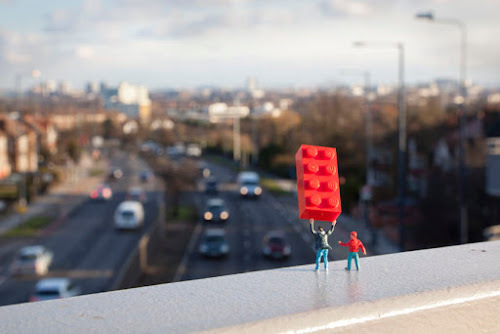 Concrete Ocean is the second exhibition of Slinkachu's work to be shown at Andipa Gallery and follows Whatever Happened to the Men of Tomorrow (2009) which focused on the relationship between an old, bald, Superman rejected by the city that once lauded him. The show opens 02 March at Andipa Gallery in London and runs until 02 April 2011. 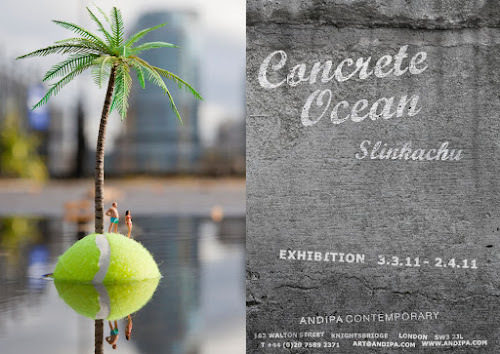 To tie in with the exhibition a limited edition print of the Concrete Ocean will be released on 02 March 2011, for more details check the Andipa website.